No plant naturally lives indoors; therefore, indoor bonsai plants need specific accommodation. Trees that naturally grow in warmer climates make satisfactory indoor bonsai plants, since seasonal changes inside most homes are minimal. Jacaranda, Schefflera, gardenia, bamboo and rubber trees all do well indoors. 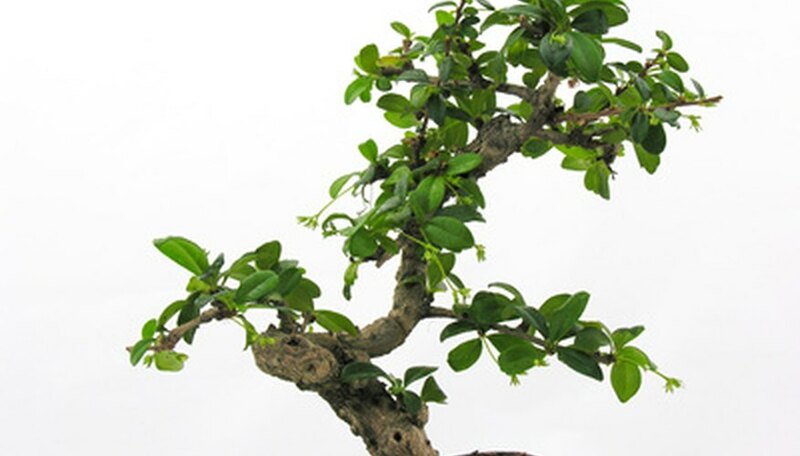 Understanding the needs of the plants is required to grow bonsai trees successfully indoors. Take bonsai trees outdoors occasionally, during warm weather. Provide fresh air and humidity to indoor bonsai trees. This is especially beneficial during the winter, when heaters operate in homes and offices. If you do not own or do not want to use an electric humidifier, fill a clay pot with water and put the pot on the top of a heater, near the plants. An alternate method is to situate the bonsai pot on a pan filled with sand or gravel. Add water to the tray to keep the sand or gravel wet. Control the temperature. Mimic the temperature of the plant’s natural habitat. If the natural habitat for the plant averages temperatures of 41 to 59 degrees Fahrenheit in the winter and 64 to 75 degrees Fahrenheit in the summer, adjust the temperature in the room with the plants to coincide with these temperatures as much as possible. Keep tropical plants in warm rooms year-round, since they do not naturally have a dormant season. Water indoor bonsai plants with care. Bonsai plants do not do well when the roots go dry. On the other hand, bonsai plants are also prone to root rot. Provide proper drainage to your indoor bonsai plant. Water slowly, with water at room temperature. Let tap water stand for 24 hours before watering to bring it up to room temperature. Occasionally place your indoor bonsai plant in the shower to simulate rain. Shower the plant or spray mist it with water early in the day so the leaves have a chance to dry thoroughly before nightfall. Expose your indoor bonsai plant to light. Plants cannot live without light. Place your plant by a window or use artificial grow lights. Rotate your bonsai plant once a month to provide more even light exposure. Feed indoor bonsai plants regularly. Feed the trees every four to six weeks with diluted liquid fertilizer. Do not fertilize indoor bonsai plants kept in cold rooms in the winter. Fertilize only when the soil is wet. Fertilizer added to dry soil burns the roots of the plant. Transplant your indoor bonsai plant occasionally. Transplant frequency depends on the species. Repot fast-growing bonsai plants annually. Repot more mature plants every three to five years. Trim approximately one-third of the roots when repotting.